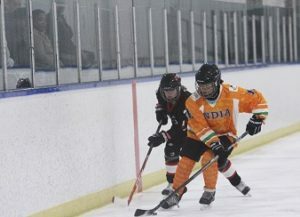 India’s national women’s hockey concluded its first ever trip to Canada with two exhibition games in Airdrie. The team defeated the AMHA bantam Rockies team 5-1 and lost to the Rockies midget team 3-1. In a historic first trip to Canada, India’s national women’s hockey team spent a few days in Airdrie Nov. 19 and 20, when the team played a pair of exhibition games at the Ron Ebbesen Arena. The team – comprised of players from the remote region of Ladakh, at the base of the Himalayas – was in Canada for the Hayley Wickenheiser Female World Hockey Festival. Known as Wickfest, the annual tournament and coaching seminar brings together women’s hockey teams from around the world for games, player development sessions and coaching clinics. After the players enjoyed stops in Vancouver and Calgary, their trip to Canada concluded with further coaching at training sessions and the two exhibition games in Airdrie. According to Airdrie Minor Hockey Association (AMHA) Director of Hockey Operations Darrin Harrold, the relationship with the Indian team started in January 2016, while he was working for the International Ice Hockey Federation (IIHF). He said he met the Indian players – some of whom were still very new to the sport, at the time – at an IIHF coaching clinic in Ladakh. Fast forward two years, Harrold said, and he made a second trip to Ladakh, this time with Wickenheiser – the retired Team Canada captain and four-time Olympic gold-medal winner. “The whole idea was to go there first and then bring the national team to Wickfest,” Harrold said. “Because I’d gone on the trip, they wanted to come to Airdrie and see what Airdrie is like. While India has had a men’s national hockey team since 1989, the women’s team formed just two years ago, according to Harrold. Many of the players learned to skate and play with hand-me-down gear. Though much of India’s climate is generally warm, winter temperatures in Ladakh drop enough to freeze the ponds, which is where the players got their start. Diskit Angmo, who plays left defence for Team India, said the trip to Canada was a whirlwind. Along with Wickfest, the tour included attending Calgary Flames and Edmonton Oilers practices, and meeting Wayne Gretzky. “Being an ice-hockey player, it’s always a dream to come to Canada,” she said. Along with meeting a hockey legend and watching NHL players practise, Angmo added the hospitality the Indian team experienced in Canada was another highlight of the trip. “Back in India, it’s very difficult for us to grow this sport,” the 22-year-old said. “But here in Canada, we are getting so much love from the people here. They’re supporting us so much, and it’s been really great. Mayor Peter Brown was a keen spectator at the two exhibition games India played in Airdrie, and performed the ceremonial puck drop at both. Team India overcame the AMHA Rockies female bantam team 5-1 in its first win on Canadian soil, before losing 3-1 to the Rockies midget team the following night. “I think it’s wonderful, and they’re so respectful and so thrilled to be here,” Brown said.